The application creates an order in the online store miniShop2, and can also send an order in the form of a letter to the specified e-mail address. 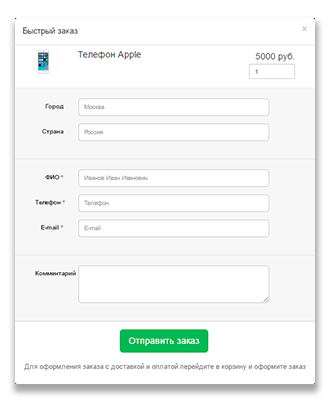 At the moment, the application does not transfer any parameters from msOptions and other modifications. Because there is a difference between adding to the cart and modifying the client side. For work it is necessary to insert a snippet on the page with the product [[! 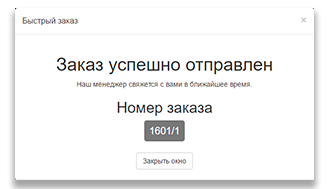 MsOneClick]], and you will have a button «buy in 1 click». Works since version MODX Revolution 2.2. In miniShop2, the delivery method and the «Quick order» payment method are added, and they are assigned to create orders through the model window. In the extra setup, you can change these methods. Quickly send an order through the modal window. To work in the lists, you need to add the class msOnclick_form_id_[[+id]] for the goods adding form. Otherwise, the values will be taken from the nearest form. A ready template for the model window with the form on the Bootstrap. Output of the title, price and preview of the product image in the model window. Correct error output for mandatory fields. Ability to add your snippets to the modal window. Adding your fields to the form with a check for mandatory filling. By default, the phone number mask + _ (___) ___-____, you can set your own mask in the settings. Checking the required fields (by default, receiver, phone, email), you can specify additional fields in the settings. Добавлены настройки для вырезания из телефонного номер кода страны. Теперь телефон стал мультиязычным. Опциональная настройка. Добавлена возможность генерации емаил адреса если убрать email из обязательных полей. Добавлена возможность разблокирования кнопки после закрытия модельного окна, при возникновении ошибки. добавлено событие "msoneclick_after_init" для добавления своих обрабработчиков на форму после её инициализации.